Komodo Island in Indonesia is probably best known for its population of Komodo dragons, the world's largest lizard. However, Komodo Island has far more to offer than just sightings of these amazing reptiles. In fact, Komodo Island has been listed as one of the New 7 Wonders of Nature and offers some of Indonesia's best diving spots, along with some pretty incredible views, unique beaches and even a handful of great hikes. If you're tired of the parties, beaches and crowds of Bali, Komodo Island might just be the escape you need (while still staying in beautiful Indonesia). Here's everything you need to know about planning a visit to Komodo Island. Komodo Island can be really hot year-round, so no matter when you visit it's important to be prepared for high temperatures. The best time to visit Komodo Island is between April and November, which is the area's dry season. The island becomes very busy in July and August, but the shoulder seasons of April to June and September to November are ideal for balancing crowds and good weather. No matter when you visit, you should be able to see some Komodo dragons and the island is suitable for scuba diving year-round. Of course, the most popular reason to visit Komodo Island is to see the famous Komodo dragons. Komodo National Park was founded in 1980 for the conservation of these animals and is now a UNESCO World Heritage Site. Komodo National Park is actually made up of several islands, the three largest being Komodo, Padar and Rinca. 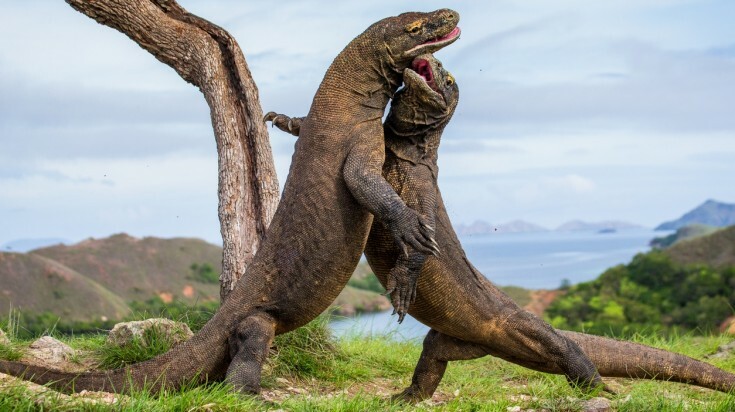 There are thought to be about 5,000 Komodo dragons living in the park and each one can weigh up to 90 kg. Their massive size doesn't slow them down, and they can run up to 12 miles per hour. 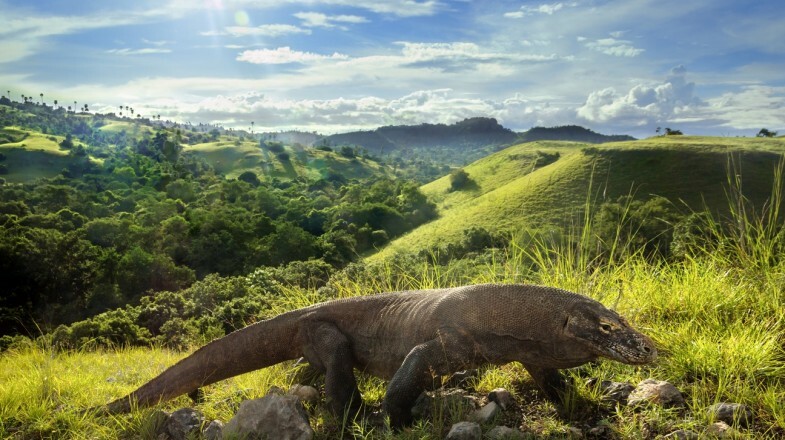 While visiting the Komodo National Park, it is best to hire a local guide as they are knowledgeable about the safest places for visitors to watch the Komodo dragons. 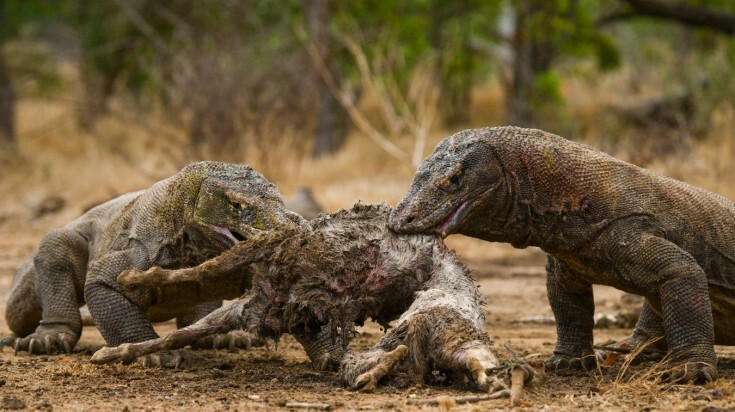 Komodo Dragons are lone hunters but communal eaters. You will often see them sharing their meal. 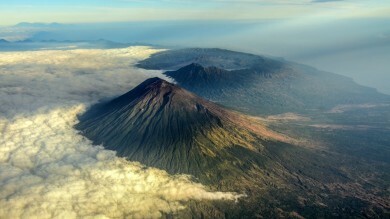 The Komodo dragons aren't the only natural wonder you can see on your visit to Komodo Island. Pink Beach is a gorgeous, unique stretch on the island's coast that really shouldn't be missed (just ask your boat operator to make a stop and you can easily enjoy about two to three hours here). 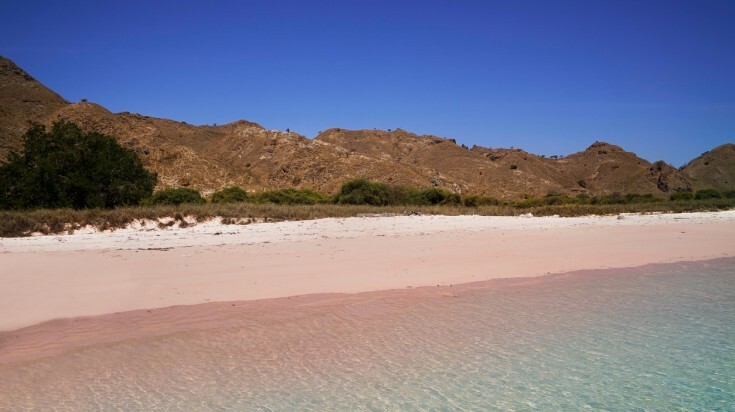 This beach has a mixture of white sand and little bits of red coral that have washed ashore, giving the beach its signature pink color. Nominated as one of the seven natural wonders of the world, the Pink Beach is one of only seven beaches in the entire world with pink sand. It is a great place to take in the island's marine biodiversity. The sea here is warm and perfect for hours upon hours of snorkeling or diving. 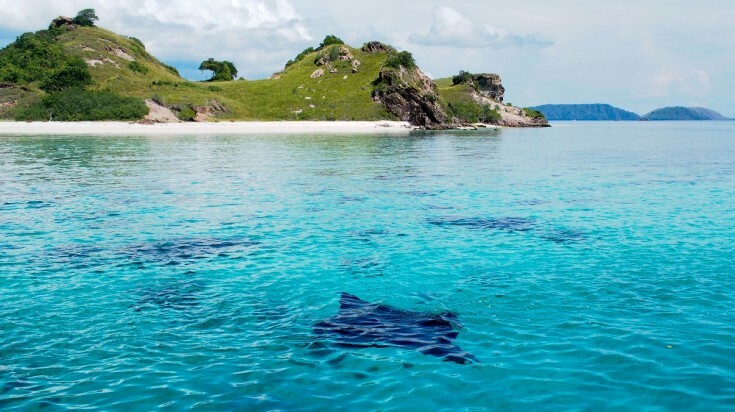 Diving is the second most popular reason people visit Komodo Island. The island is known for being one of the most beautiful and diverse dive sites not only in Indonesia but the entire world. 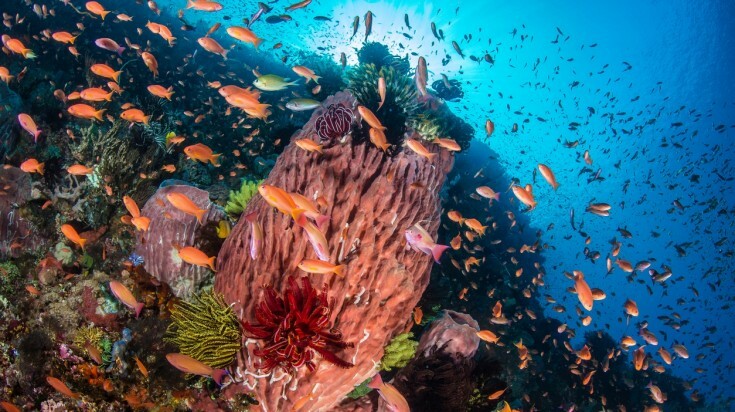 It has more than 30 dive sites fit for all levels! 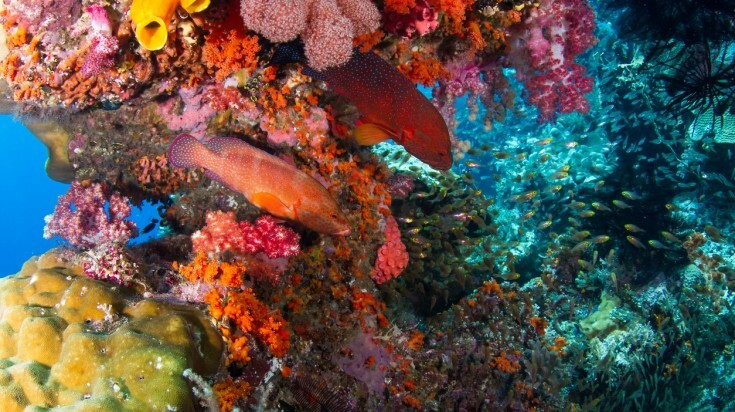 This is in large part thanks to the island being a protected area, meaning the waters off its coast are well-preserved. Some of the dive sites even allow you to dive through caves like Batu Sabun or float above pinnacles like Tanjung Loh Sera. 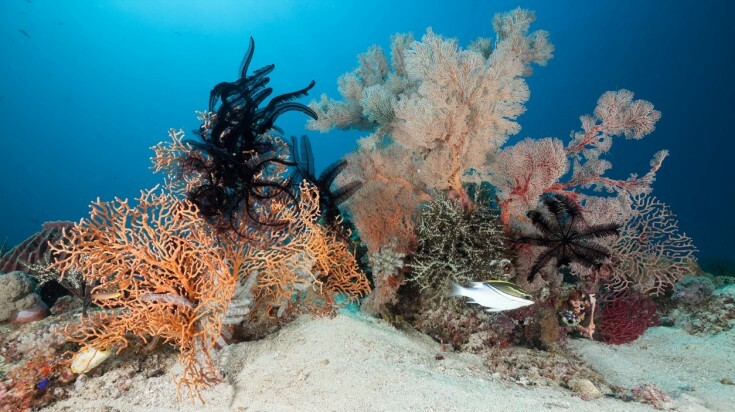 The waters surrounding Komodo Island are home to over a thousand species of fish and about 250 species of coral. You'll have a chance to see manta rays, reef sharks, seahorses and even dolphins! If you are into underwater photography, try Sabolon Island as it has clear waters and a great starting point for your diving adventures. If diving isn't your thing, many of these diving spots also offer options for snorkelling. If visiting the largest living lizards on the planet while relaxing on the beach is your idea of fun then the 11 Day Beaches & Dragon Journey might be for you! 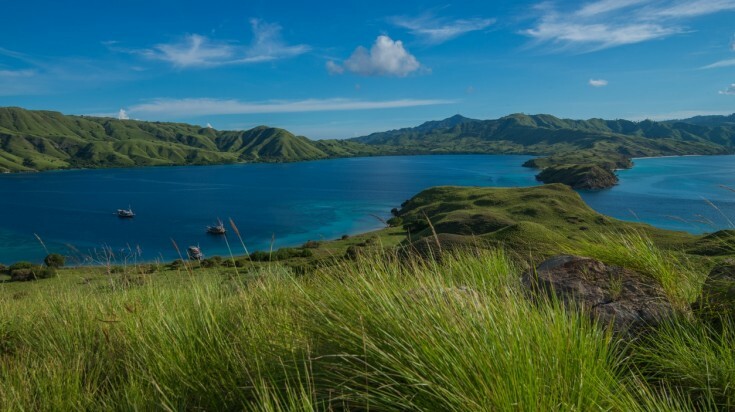 There isn't much to offer in terms of hiking on Komodo Island itself, but there are plenty of hiking options if you visit its neighboring islands. 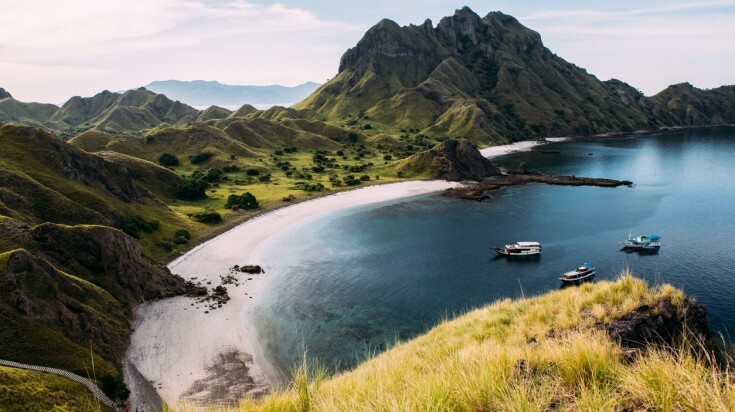 You can hop over to Padar Island, the third largest island in the national park, and hike to its summit — Padar Lookout. 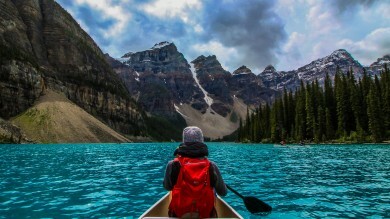 This hike can take you anywhere from 20 – 30 minutes depending on your pace. From there you'll have one of the best views in all of Indonesia and you should even be able to see all of Komodo National Park. The best time to arrange a hike would be either during sunrise or sunset in the months of April to November. Finally, another popular hike in the park is on the smaller island of Gili Lawa or Gili Laba Darat. This is a tough climb, but it is well marked and offers amazing views of the area and is popular as a sunrise hike. You will usually have to begin very early, around 3 am, to start this hike that runs through a short but steep climb. This hike or walk can be completed in 20 minutes. Don’t forget to carry your good pair of walking shoes and a torch! No matter where you may be in Indonesia, it is relatively easy to reach Komodo Island. The easiest way is to fly from a major airport (like Bali or Jakarta) to Labuan Bajo Airport on Flores island, also called Komodo Airport. From there, you can either walk to the town of Labuan Bajo (about 20 to 30 minutes downhill) or take a 10-minute taxi ride. Once you reach Labuan Bajo, it is fairly easy to find a boat that will take you over to Komodo Island. 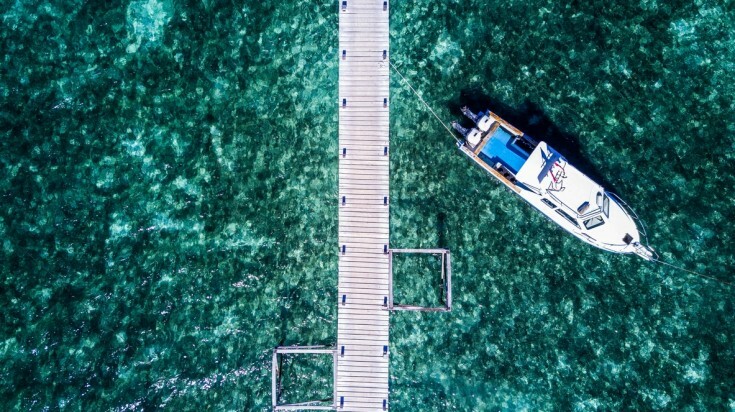 The ride takes about two hours, so you can even visit it in a single day (though we recommend taking your time to really enjoy all the Komodo National Park has to offer). The only accommodation on Komodo Island itself is a collection of bungalows that are owned and operated by the National Park. They are usually reserved for special guests and film crews. 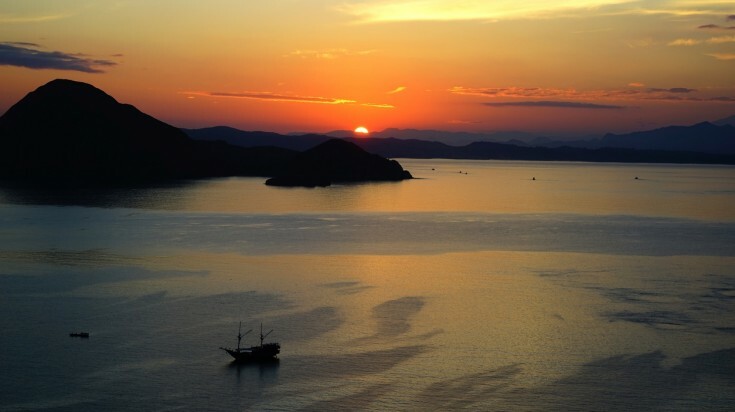 As such, most visitors to the area spend the night on nearby Flores (usually in Labuan Bajo). Below we give you four best accommodation options in Labuan Bajo. A typical hostel, Dragon Dive Komodo offers both dorm beds (starting at USD 17* a night) and private rooms (starting at USD 90* a night). This is a great choice if you are budget conscious and are interested in meeting some fellow travelers. This hostel is known for its laid-back atmosphere and even has a swimming pool, bar and restaurant on site. Best of all, it's not far from the airport. This is a great in-between hotel for those who don't want to stay in a hostel but aren't quite looking for that resort vibe either. The Green Hill Boutique is a minimalist guest house with 9 rooms, each offering sea views. Rates start at USD 36* a night and book up fast! If you're a fan of resorts, this PADI 5-star accommodation is perfect for you. The Blue Marlin Komodo is just a seven-minute drive from the airport and has a swimming pool, a bar, a restaurant, a shop, and laundry facilities. You can also enjoy the hotel's water sports, including diving lessons. Private rooms start at USD 70* a night, and dorms are also available for USD 12* a night. Finally, for the ultimate touch of luxury, there's Angel Island, an eco-friendly resort made up of 10 villas among hibiscus gardens and white sandy beaches. Angel Island is a private island that borders the National Park. Each villa features a private patio, air-condition, open-air bathrooms and a TV. The resort also offers a range of water sports, massages, diving lessons and trips to the nearby islands. Rooms start at USD 335* a night. As you can see, there is so much more to see and do on Komodo Island than just seeing the Komodo dragons. Whether you're active and love to dive and hike, or even if you just want to see something totally unique like the Pink Beach, this island and the wider Komodo National Park has so much to offer its visitors. Komodo is such a fantastic area for a tropical getaway, I absolutely loved my vacation there last year! took so many pictures when diving at Manta Alley, it is a fascinating spot for underwater photography. and those dragons, wow! the most surreal land creatures I ever encountered.